The migration process describes the actual porting process in which all data from a version 7 database is transferred to a new/existing version 8 database. The required amendments to the data set due to the redesign of the authorization concept are also carried out. Firstly, a new database is created as described in the section “Creating and managing databases”: https://help.passwordsafe.de/v8/1/en/topic/erstellen-und-verwalten-von-datenbanken#Erstellen. The data migration is activated in the third step of the wizard. 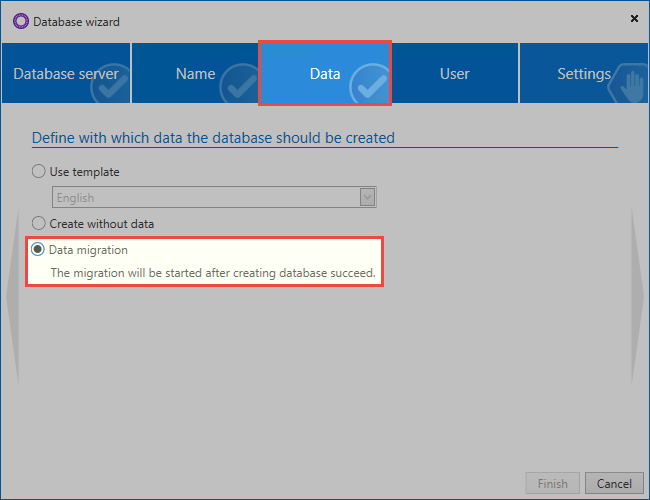 After completing the database wizard, you can go directly to the migration wizard. *Only an import from Password Safe v7 is currently supported. 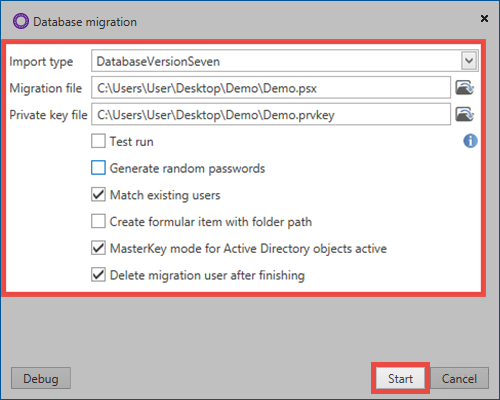 If you wish to migrate from older database versions, an intermediate step via version 7 must be carried out first. In addition, when migrating a server database, the private key file in .prvkey format that belongs to the backup must be selected. Users are requested to Enter the password for single and multiuser databases. The complete migration is carried out as a test via the test run. Users do not receive passwords in this case and thus cannot log in. This step is only for test purposes. For local users or users in deactivated Masterkey mode, randomly generated passwords can be created. These are sent to users via email. If the passwords are not automatically generated, they need to be manually issued in the database. Merging existing users: If an existing database is migrated, any duplicate users are merged using the name. The rights will be added together. * If this option is inactive, a “*” is added to the name of the newly imported user. In the next run “**”, etc. Create form field with folder path: A form field is created that replaces the folder path from Password Safe version 7. This field contains every record and allows you to search based on the old folder path in future. Master Key mode for Active Directory objects: It is decided here whether the AD user is imported in Master Key mode or using end-to-end encryption. Note that a corresponding certificate is created in Master Key mode. If documents had their own folder structure in version 7, the document folder can be added as an organisational unit. It is recommended that the migration user is deleted, as this is authorized by the migration to all records in the database! As a rule, this user is no longer required after the migration, since the administrator is taken as the user from the migrated backup and will be used in the future. !Before importing, you should carefully consider whether to import in Master Key mode or using end-to-end encryption. This setting cannot be changed afterwards. You can find further information on this in the section Active Directory link. *It should be noted that all local users as well as all those who will be migrated via end-to-end encryption will receive an email containing a randomly generated password. Users who are migrated in Master Key mode can continue to log in with the domain password. After the process has been started, the data are analysed and processed. Depending on the database size, this step can take several hours. *If an error occurs, the wizard will generate a log file entry. This can be found under the path C:\Users\User\AppData\Roaming\MATESO\Migration. The data can also be migrated into an existing database via the ribbon. The migration process remains the same. This function allows multiple databases to be merged. Identical records, documents, forms, etc. are duplicated. Exception: Duplicated users will have a * added to the end of the name. They can, however, be merged together. Tags are not duplicated if they are written identically. !If several databases are to be migrated into one, this must be done with the same migration user. This user may therefore only be deleted during the migration of the last database.